HARLEM — Khalid Baylor wasn’t planning to be a firefighter, but eight years ago he was looking for a career change when a black firefighter handed him an application for the New York City Fire Department at the Harlem Day Parade. 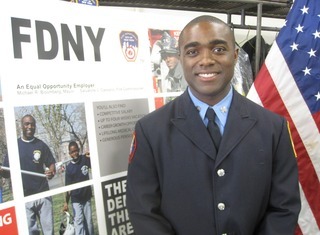 “I was just out in the crowd and I saw this black firefighter who gave me an application and encouraged me to apply,” said Baylor, a Harlem resident. He then went a step beyond. He made copies of the application and handed them out to his friends. Eight years later, Baylor, is an example of both the success and difficulties of recruiting minorities to the largest firefighting force in the country. None of his friends followed through with the fire department application, but today, Baylor is a firefighter with Engine 35/ Ladder 14 on East 124th Street and Third Avenue. He is also one of the faces of the FDNY’s efforts to diversify its ranks, appearing on a new FDNY ad campaign with his 11-year-old son Khalid. “What I have seen is that a lot of community residents don’t know about the job opportunities with the fire department,” Baylor said. Bike & Bus Lanes and You!